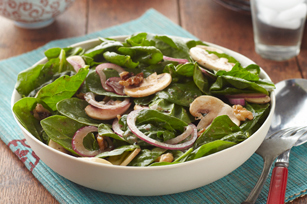 Top off a bed of spinach with sliced mushrooms, red onions, walnuts and our balsamic dressing. Spinach salad has never tasted so good! Toss spinach with mushrooms and onions in large bowl. Mix dressing and nuts in microwaveable bowl. Microwave on HIGH 30 sec. or until heated through; stir. Add to spinach mixture; toss to coat. Serve immediately. Combine spinach, mushrooms and onions. Refrigerate until ready to serve. Microwave dressing and nuts as directed. Add to salad; toss to coat. Prepare as directed, adding 1/4 cup Oscar Mayer Real Bacon Bits to dressing mixture before microwaving.